The Pays de Redon has some awesome discovery trails ! The baptism of Clovis in 496 was a key event in the history of France and Saint Melaine, who was born here, took part in it ! The Sentier de Saint Melaine starts from the municipal vineyard beside the river Vilaine. It recalls the baptism of Clovis, the first king of what would become France, and recounts the delicious history of food and drink. This 2000 year old Gallo-Roman chapel, built of red sandstone and black shale, is an absolute gem. This hilly trail presents mountain bikers with a challenge! posts with quizz and sketches introduce information and questionning on nature, geology.... The only trail of its kind ! Activities and works of art all on the theme of pottery around the Cirque des Lises which takes its name from the clay or ‘lise’ found there. It is also the site of fetes and other events. Round off your trip with a visit to the Patiau, a ceramic art and craft centre. LA SOURCE PROFONDE ET LES GRANDS ROCHERS DE QUIP at ALLAIRE. 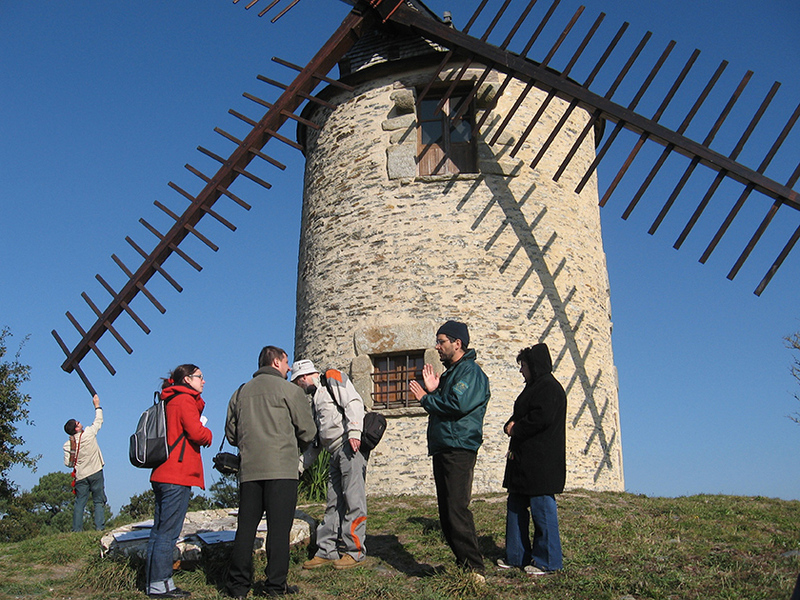 DISCOVERY BOOKLET ABOUT THE MILLS AT ST-JACUT-LES-PINS. Windmills on the Butte des 5 moulins with a discovery tail across moorland and through pinewoods ; the watermill beside the Etang de la Vallée lake, restored by the local council and run by the Eau Grée des Moulins association ; another windmill beautifully restored, with a roof that turns around ! There’s definitely something in the wind at St Jacut-les-Pins! A hillock overlooking the river Vilaine is a perfect place for a fortress ! The Seigneurs de Rieux, close neighbours of the Dukes of Brittany, thought so and built this castle whose ruins are the site of a discovery trail and impressive scenery. Two belvederes, one on each side of the river Vilaine, have been enhanced by the artist Polisky. One is on the castle walls and the other faces it on a hillock on the opposite bank. HISTORICAL (or HYSTERICAL!) CRAZY GOLF AT PONT D’OUST, PEILLAC. Be a knight, an eel or a sailor ! 18 fun and informative holes make this unique crazy golf a must for all the family ! 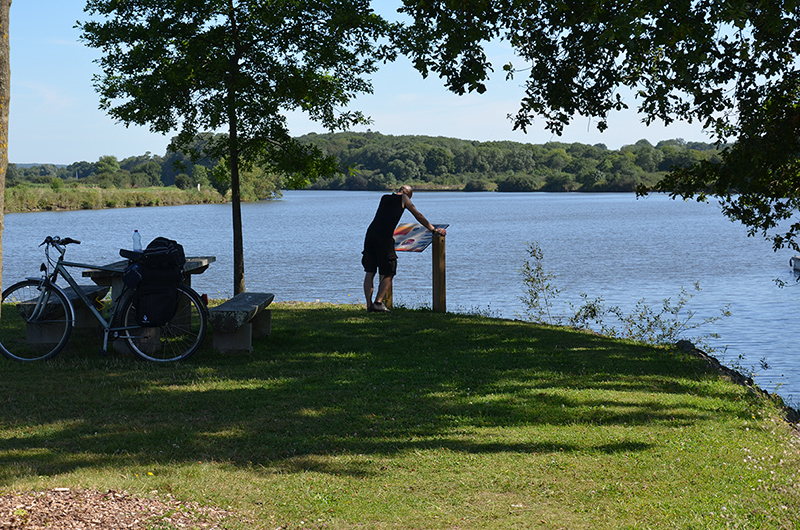 This trail route runs past a succession of beauty spots : the port of Foleux, the chapel at Les Alliers, Belvédère de Champ-Guy… So choose a spot, park your car and take a short walk to enjoy the beautiful scenery. On the towpath between Redon and Nantes a series of illustrated boards by the locks at Les Bellions, Plaines de Guenrouet, Port St Clair and Pont Miny are packed with all sorts of informative hints which will probably make you want to ‘do’ the whole canal ! An impressive fortress which, it is said, Duguesclin and his soldiers managed to enter by pretending to be wood-cutters ! Nowadays, peace-loving wood-cutters work around the castle to maintain the magnificent arboretum which is a country park. Here, the Valley of the Don forms an attractive, mysterious gorge inhabited by many a holy figure. The Don takes its name from the Celtic goddess Dana. The valley also has a shrine to the Virgin Mary and rocky outcrops are named after the fairies, Joyance and Carabosse… An information booklet is available to highlight this delightful, colourful walk. The old Roman way which is paved in places crosses the river Don at Conquereuil. An information booklet is available about this walk. Our villages are packed with stone-built cottages and houses, often with fascinating features that are well worth taking a look at. This booklet, which was specially written for ‘non-specialists’, features 10 selected villages and highlights what to look out for when visiting these ‘little gems’ . A discovery trail along the Roman Way in Guémené Penfao. Follow Joyance the Fairy with the aid of this enchanting booklet which contains historical notes, drawings, anecdotes and poems. Definitely a booklet for history enthusiasts! It tells the chronological history of the town of Redon and gives detailed information about each of the 25 stops on the tour. A booklet packed with games and anecdotes to help children, parents and grandparents to discover the Pays de Redon in a fun, educational way. This is just an overview of all the discovery trails and accompanying booklets/leaflets, singing and story walks, guided tours, crazy golf, discovery games and mountain bike trails available in the Pays de Redon. Watch this space for more detailed information!